Mjøstårnet is named after its neighbour and Norway’s largest lake Mjøsa. The record-breaking construction will sit on the edge of the north-eastern tip of the lake in the small town of Brumunddal, an hour and a half’s drive north of Oslo. 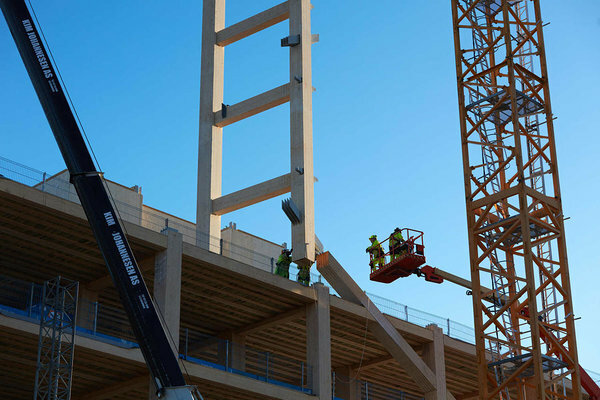 “The assembly and construction of the Mjøstårnet is nothing short of world-class engineering and will be managed without external scaffolding, despite the complexity of working at heights. We are primarily using cranes and supplementing with lifts as needed. We have reached 33 metres to date, meaning we have 48 metres to go,” says the inventor of the project, Arthur Buchardt. Arthur Buchardt states that he can evidence the climate friendliness of building with wood. “A project group established by Norwegian road authorities investigated the possibility of building the world’s longest timber bridge across Lake Mjøsa. Their studies show that building with wood instead of concrete can reduce CO2 emissions by up to 30 percent,” says Buchardt. Buchardt hopes that his ambitions to build the world’s tallest timber building may inspire others. 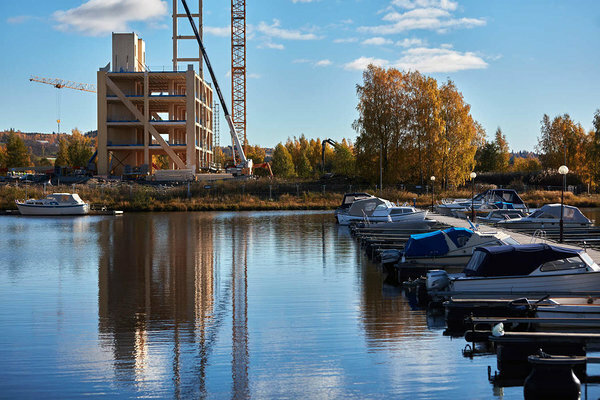 “Through Mjøstårnet we demonstrate that it is possible to construct large, complex wooden buildings. 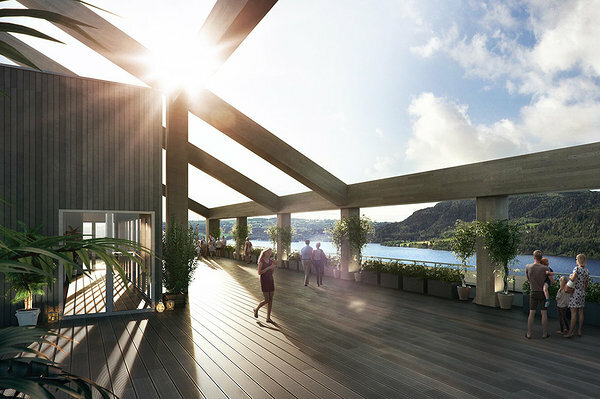 The planned construction of the Norwegian Government quarter can become a wooden landmark internationally,” says Buchardt. Mjøstårnet is the world’s tallest? 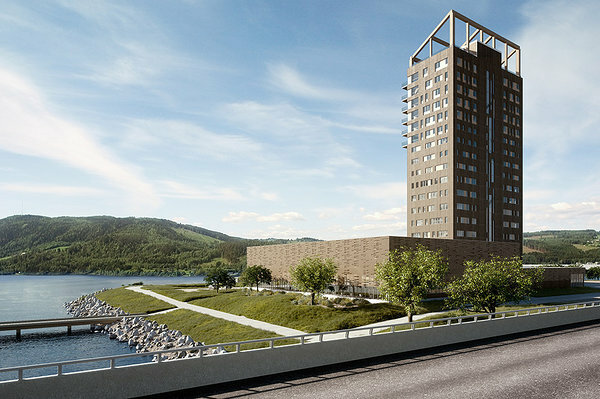 According to director Rune Abrahamsen of Moelven Limtre AS, the answer is mainly because “HoHo-tower” in Vienna – which will stand 84 metres tall – will not be defined as a timber building. “For a start, Hoho is not a timber building according to how the definition of this will be. It’s a wood-concrete-hybrid building – also known as a composite. Second, the building will not be completed until a month after “Mjøstårnet” is completed. But the latter is a moot point if the first is correct. And there is little doubt that this will be the case,” Abrahamsen says. Both “Treet” in Bergen and “Mjøstårnet” in Brumunddal will be defined as timber buildings, while buildings with supporting concrete cores – such as “HoHo” in Vienna and Brock Commons in Vancouver – will be defined as wood-concrete hybrid buildings – or composite buildings. 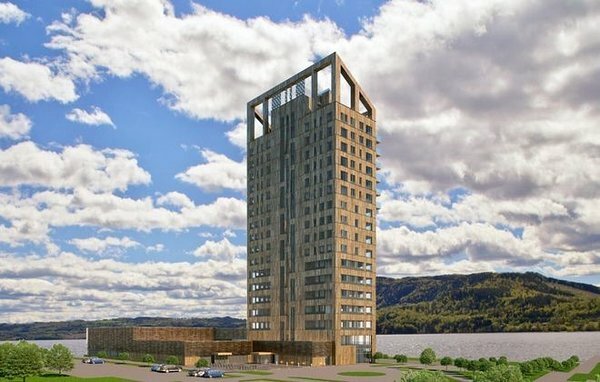 Subsequently one may expect that Mjøstårnet will be named the world’s tallest timber building when completed,” Abrahamsen says.